Using the parameters of VC Addon Multimedia Playlist Slider you can create any color scheme for your player. 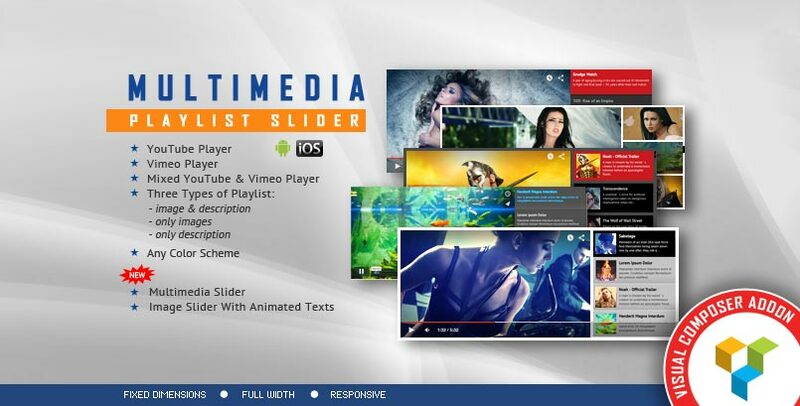 VC Addon Multimedia Playlist Slider can be used as an YouTube Vimeo video player or as a multimedia slider. IF YOU NEED ONLY THE JQUERY PLUGIN FOR VC ADDON MULTIMEDIA PLAYLIST SLIDER, CLICK HERE TO DOWNLOAD. IF YOU NEED ONLY THE WORDPRESS PLUGIN FOR VC ADDON MULTIMEDIA PLAYLIST SLIDER, CLICK HERE TO DOWNLOAD.